Western Colorado will see slightly warmer temperatures than the eastern plains Sunday as a generally calm week kicks off across the state. Parts of the far eastern plains will see areas of fog early in the day Sunday under a mass of cooler air that will keep highs in the 50s, about five degrees below seasonal norms. Mostly sunny skies will prevail across the region later in the day. Dry and warm conditions are expected for Monday and Tuesday as highs reach the upper 60s, and even low 70s around Trinidad out to Eads and Springfield. By Wednesday, high temperatures will drop off by nearly 20 degrees following a cold front that will pass through the area Tuesday night. Highs in the 50s are expected to close out the work week, and may continue into the weekend. Low 60s will prevail across most of western Colorado Sunday under partly to mostly sunny skies. Rain and snow are not expected with very dry air over the area. Fewer clouds are expected Monday, and temperatures will move into the mid-60s for afternoon highs. Temperatures will be similar Tuesday, though winds will increase during the afternoon. Dry air will persist; however, a few snow flurries can be expected in the northern mountains. Calm conditions return Wednesday, with highs dropping a few degrees ahead of an upper level trough moving into the area for the close of the week. Thursday and Friday are expected to be colder, with an increased chance of snow. 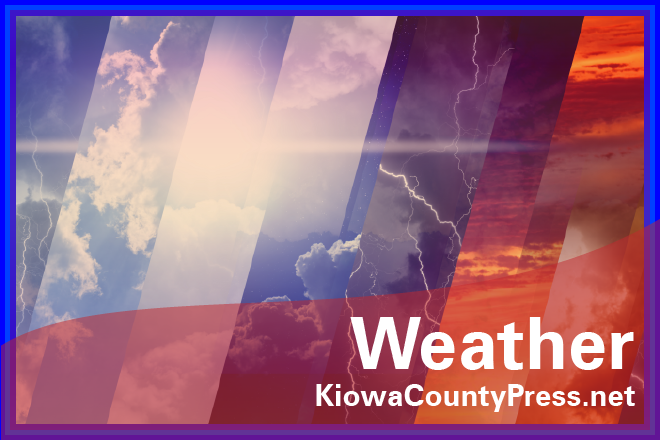 *Note: KiowaCountyPress.net may receive compensation for purchases made through the link, but is not otherwise compensated for mentioning the product.